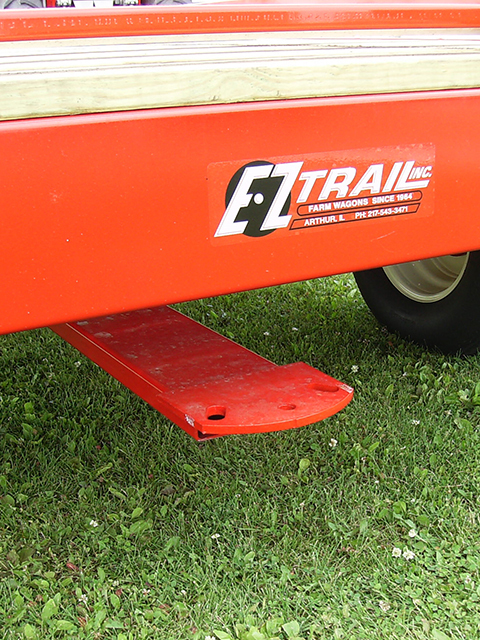 E-Z Trail floors are designed lower, lighter, stronger, & longer lasting. The 2 x 8 floor boards and 4 x 8 sills are made of Southern Yellow Pine treated for long life. The special cut sills are 27% stronger than commonly used 6 x 6 sills. The floor is framed all around in steel for added strength and warp prevention. Since there are fewer collection points for residues which cause wood decay, floors will stay cleaner and last longer. 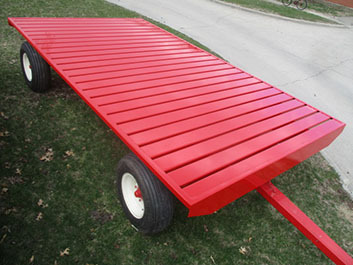 We offer standard flat rack sizes of 9'x16', 9'x18' & 9'x20'. Other custom sizes are also available. 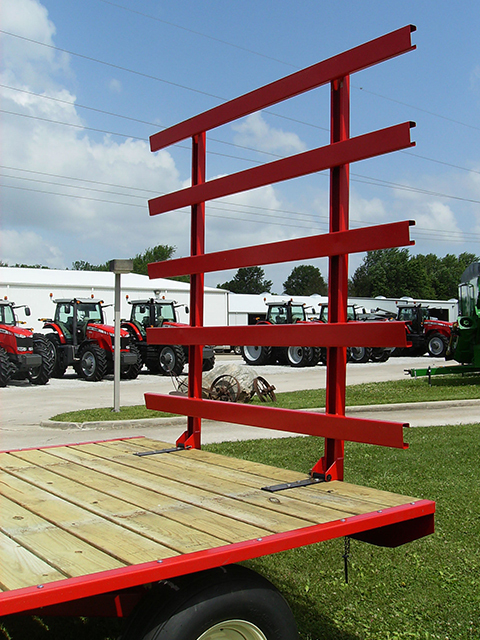 Now available: custom-built All-Steel flat racks for industrial use. Contact us to get a quote on one that's just the right size for you. SAVE YOUR BACK! The human body is no match for a mechanical bale thrower. 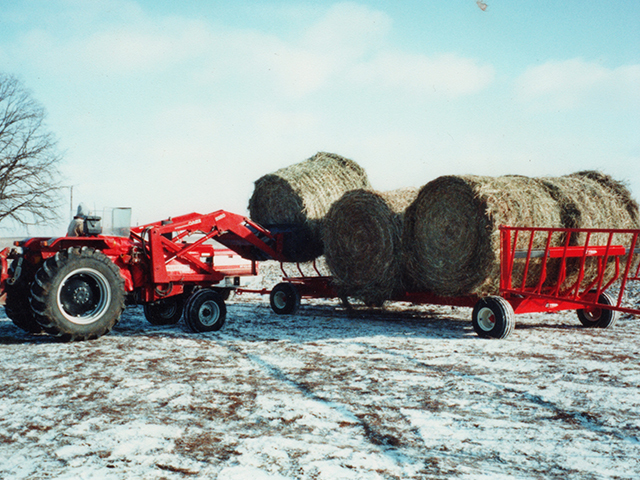 Major back problems often develop from bending, lifting, twisting, and throwing when unloading heavy bales of hay. It can be a labor intensive job that is often required from family members whose "britches" are too small for the challenge. 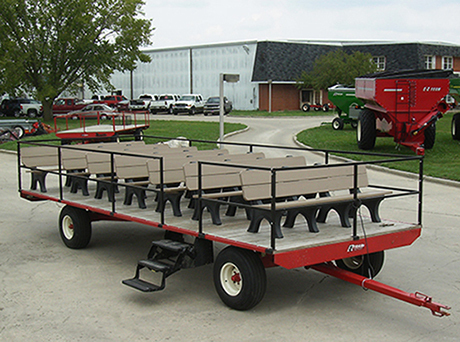 Call today for the name of your local E-Z Trail farm equipment dealer! Available in 2 sizes. 9' x 16' and 9' x 18'. Sides are 8' tall and made of high quality 1-1/4" sq. tubing! 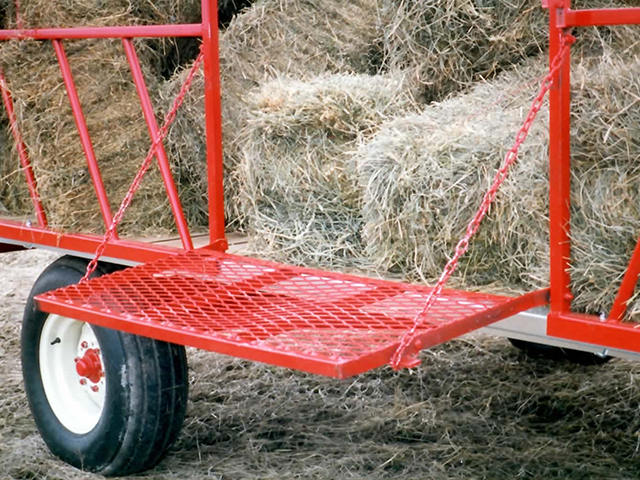 The front gate & side doors are mounted flush to the floor & made of flattened expanded metal which provides a smooth "slide" exit for unloading heavy bales without lifting. The "see-thru" front gate is E-Z to open with its pressure release latch & EZ lift spring. It serves as a platform to begin unloading. 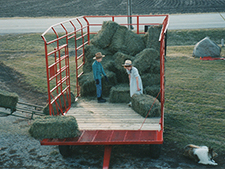 Bales unload easier starting at the front, then unloading the rear half thru the side doors. It's called "LIFO," last in first out. 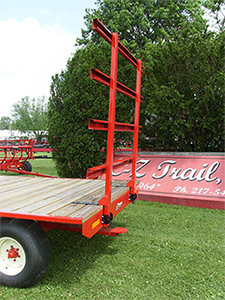 However, rear swing gates are available as an option. 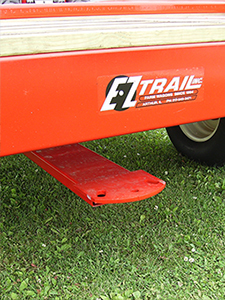 E-Z Trail floors are designed lower, lighter, stronger, & longer lasting. The 2x8 floor boards and 4x8 sills are made of Southern Yellow Pine treated for long life. The special cut sills are 27% stronger than commonly used 6x6 sills, according to the University of Wisconsin Forestry Dept. The floor is framed all around in steel for added strength and warp prevention. Since there are fewer collection points for residues which cause wood decay, floors will stay cleaner and last longer. 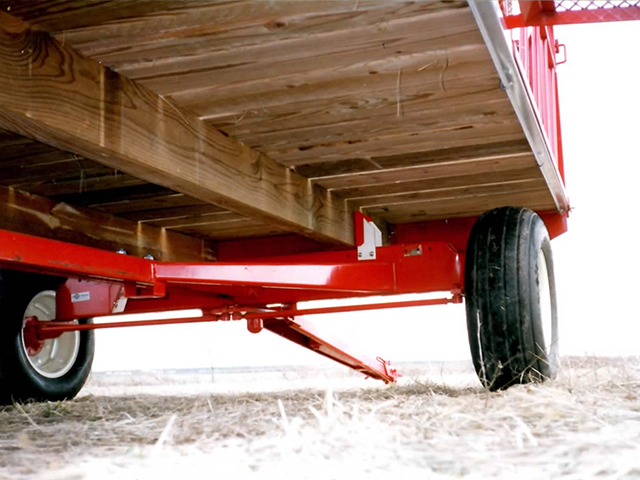 The side doors open to form a horizontal platform, or tilt down 45° for sliding bales into a conveyor. HARNESS ENERGY THAT'S ABSOLUTELY FREE! 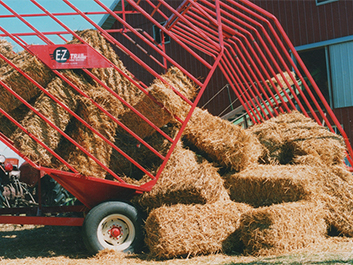 The bale plunger packs enough punch to push the bales up the chute into the basket. The free energy comes from your baler by reducing some of the spring tension at the bale chamber. The bales going up the chute simply provide some of the back pressure required to compress the bales. 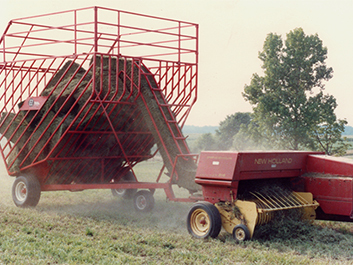 Therefore you eliminate all manual labor without adding any burden to your baler. The standard basket capacity is approximately 100 bales and unloads by gravity, "more free energy." A simple trip lever releases the rear gate latch and in a matter of seconds the basket is ready to load up again. 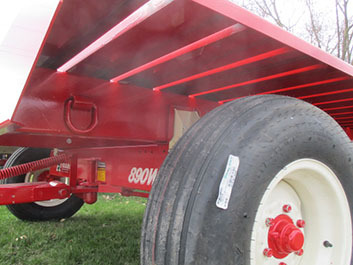 Options available: 3' 30 bale extension, center hitch for N.H. balers. The basket dimensions are 12'6" long and 11' high. The special width 10' front, 11' rear is a patented feature. 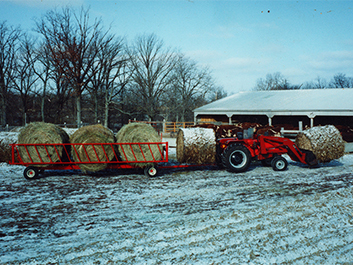 The tapered sides allow bales to unload quick and E-Z without lodging. Tire size 11L 15 8 ply; wobble free caster wheel 20.5 x 10. Basket is shipped with axle, floor and sides pre-assembled, final assembly requires 1-2 hours. High strength square tubing 4" x 1/4" axle 1-1/2" 12 gauge and 1-1/4" 14 gauge. Standard - Dual Front Caster Wheels for increased stability. 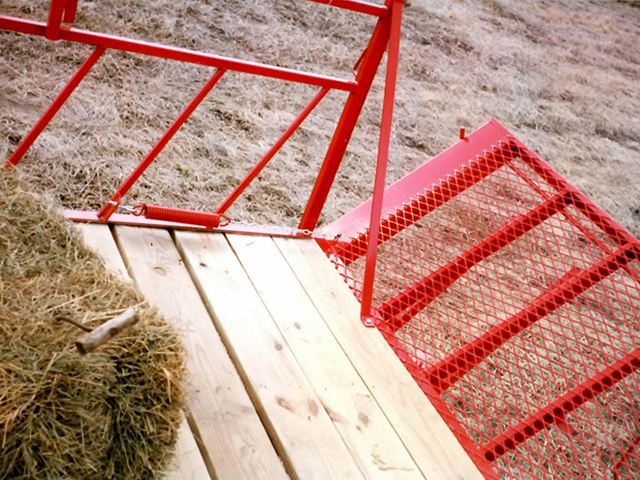 "My Bale Basket works on any hills that I can drive my tractor on. It is the labor-savingest machine on my farm." "We feel our two Bale Baskets have paid for themselves in one season. They work much better than I thought they would. I now enjoy baling." 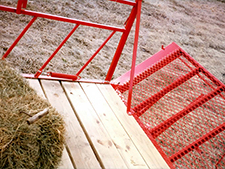 "Over the last 25 years I have owned some very expensive bale handling equipment, but my Bale Baskets work better than anything I have ever used." "My Bale Basket receives the bales from my new J.D. model 336 baler as fast as I can drive. My only regret is that I didn't have one 20 years ago. I absolutely love it!" Here it is! 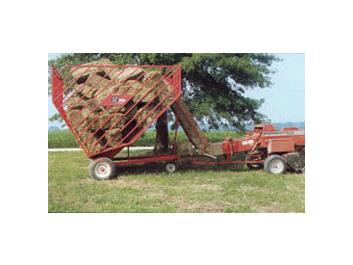 A big bale carrier with quick attach 22 ft. feeder panels! Side panels slide out to 11 ft. wide and swing open for EZ loading. 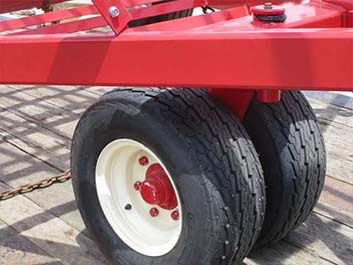 Low profile 26 x 12.00, 12 ply flotation tires for low comfortable feeding. Panels swing open for loading with 3 point hitch or front loader. It's a breeze to move hay bales from field to feasting spot. Cattle are well fed when winter pasture is snow covered! 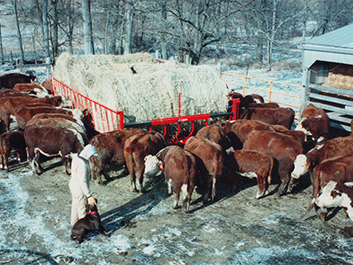 Cattle have 66 ft. of all around feeding area for hay, straw, or corn stalks. Five days later...and ready for a refill! Side panels slide in to 5-1/2 ft. width as cattle push toward center. Photo shows total clean up except for a few scattered corn stalks. 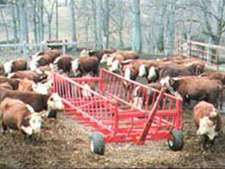 Here's how herds of hungry Herefords n' Holsteins...save hundreds of happy herdsmen "heaps of hay". Testimonials from cattlemen, and women, are saying their CF890 Bale Carrier Feeders are saving enough hay and labor to pay for themselves the first year! 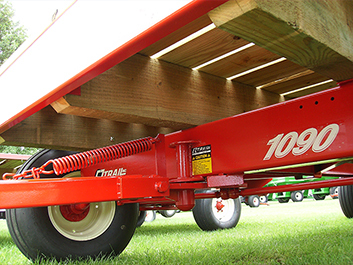 The patented two-in-one CF890 has 22 ft. long feeder panels that slide out to 11 ft. wide when loaded. The panels then slide in to 5½ ft. empty width as the cattle press toward the center while feeding. Special hinges allow panels to slide freely, even when one end slides ahead of the other. The bale feeder loads easily without opening the side panels when using a front-end loader and a bale spear. The side panels hinge on one end and swing open with a Dolly wheel for loading with a 3-point rear bale spear. 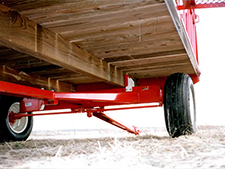 ...Or they are easily removed by pulling just one pin when used strictly as a bale carrier. Four bale cradles are provided to feed up to eight 5 ft. or six 6 ft. bales at one time. 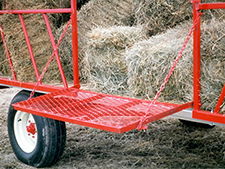 The self-cleaning cradles eliminate spoilage from mold or mildew. Cattle can clean up any loose hay that may fall through the cradles before it is trampled or wasted. The spring assisted "E-Z Hitch" tongue pins up out of the way to stay clean from manure droppings, or to prevent freeze-down during winter. The feeder has 16,000 lb. 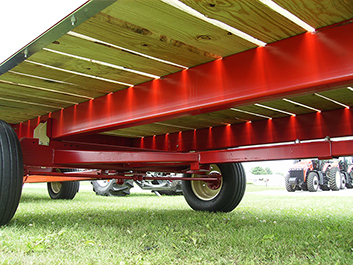 capacity, a 90" wide wheel tread, and comes with low profile 2600 x 12 in.12 PLY flotation tires. It is built for long life outdoor use; vital components of E-Z Trail's accurate steering are weather protected. The most regrettable testimonials we have are from people who wish they had known about the Dual Purpose Feeder before they bought more expensive feeders that have less capacity, are not self-cleaning, and cannot be used as a bale carrier. We are doing everything we can to make the Feeders available to you. We can also provide financing & delivery. "My Bale Carrier/Feeder is a real Hay Saver! The way they clean it all up is hard to believe. Even underneath there is no hay left on the ground." "It's easy to keep hay out for my cattle with the bale self-feeder. It is a nice outfit. I don't have to worry when there is snow on the ground. My neighbors are impressed with it too." 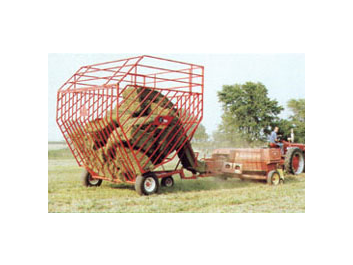 "I really like my Bale Carrier/Feeder. It pulls nice and handles well. It doesn’t waste much hay. Everybody that has seen it is impressed. I wish I had a couple more; it’s just fabulous!" "It works great! My bales are small, so it took 14 bales to fill it, and they hardly wasted any at all. I am well satisfied and would recommend it to anyone interested in one." "The concept is terrific. I am a cattlewomen who farms alone. I also represent New York on the cattlemen's beef board and am a NCA Committee vice chairman. The Carrier/Feeder is the answer for feeding my cattle, especially when I am away for 5 or 6 days at a time." 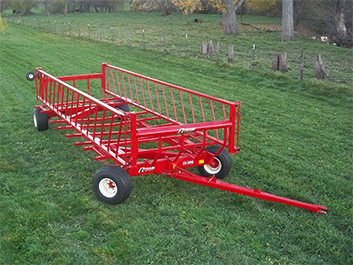 "Hauling and feeding round bales with the Carrier/Feeder saves hay and makes my job so much easier that I am going to replace all my portable bunk feeders." "It's the smoothest and straightest trailing wagon I have ever used since you have eliminated all wear points in your steering. I recommend that you don't tell anyone your secret." "We had such a rough winter in '93-94 that I had to use 2 CF890's to keep my cows fed. Winter or summer it's a good working all-purpose trailer. We haul our bales quite a distance. I wish it were 3 feet longer, then I could haul 12 big bales. It has plenty of strength." 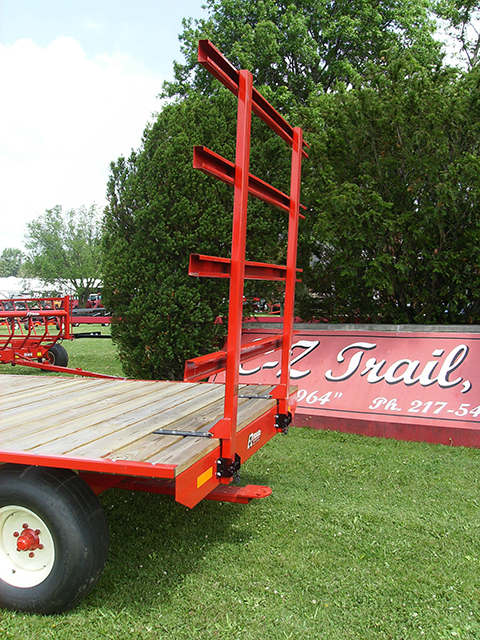 "We bought two Apache portable bunk feeders before I saw the E-Z Trail CF890. We can't haul hay with them and can only feed 4 bales at one time. Now that I bought one CF890 I can haul eleven bales or feed eight bales at one time. I want to get another one as soon as I can." 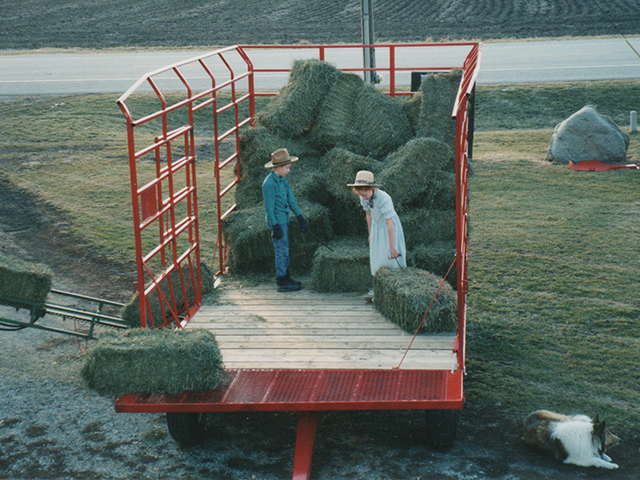 "My neighbors look on with envy when they see me haul eleven bales or feed eight bales at one time. I have cut my chore time from one half day to two hours." 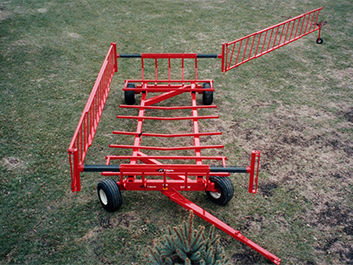 "The Bale Carrier/Feeder is the best thing I ever bought for my farm. I really love it and like to tell other people about it." "IT'S HARD TO BELIEVE, my cows waste less hay feeding eight bales...than from one bale in my other feeders!"